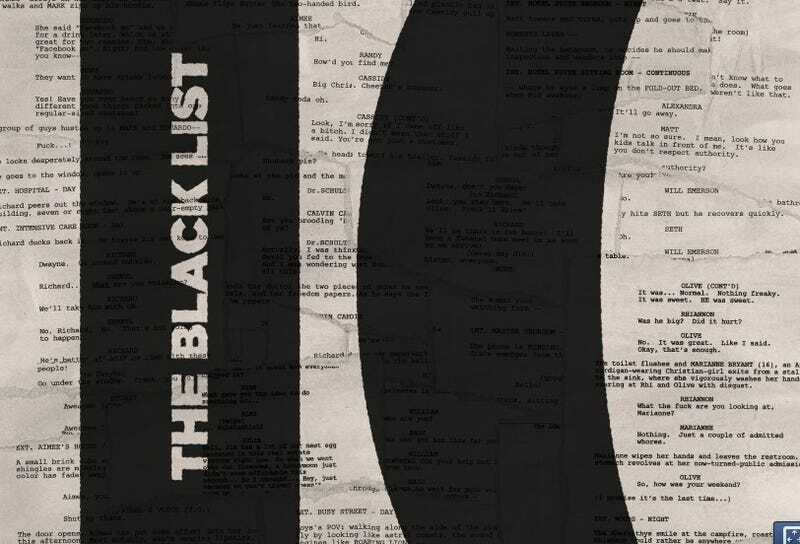 Every year "the Black List" unloads an exciting compilation of what many consider to be the "best" unproduced screenplays in Hollywood, selected by a secret panel of insiders. And the 2014 Black List is overflowing with new scifi. Our time is now, people! In case you're wondering what the Black List is (and how it started), the new list begins with a little FYI column as well as a disclaimer that these scripts are not necessarily the "best," but just the ones that were most liked by this mysterious panel of secret operatives. The Black List is not a "best of" list. It is, at best, a "most liked" list. Argo, Inglorious Basterds, The King's Speech and Transcendence are all scripts that have appeared on this famous list, which has been shining the light on engaging scripts since 2005. But truly, this year has the most genre material. We're bowled over by the amount of scifi that's being tossed around Hollywood. We're not surprised, but we're definitely excited. Here are the genre goodies we picked out, and you can read the full list right here. In near future London, a revolutionary technology has been invented that can record sounds hours after they were made. Detective Harry Orwell, inventor of this technology, is part of a pilot program where investigators record and analyze past sound waves and finds himself the prime suspect while investigating a string of brutal murders. A young woman, feeling directionless, stumbles upon a mysterious courtyard where she is transported into a sitcom-like universe, becoming a major character on this "TV show." A woman held captive in the futuristic smart house of a serial kidnapper realizes that her only hope of escape lies in turning the house's sentient computer against its creator. Find out the rest of the Black List 2014 scripts on the next page. A CIA drone coordinator battles his own psychological health while trying to decipher whether his wife has been replaced. A genre bending action comedy about a pill popping thug who begins to develop superpowers. The investigation of a murder on a moon colony. a young actress in 1930s Hollywood, leading him to uncover conspiracies involving THE WIZARD OF OZ and Metro Goldwyn Mayer brass. A woman tries to lead her children to safety after the world is invaded by monsters who turn you insane upon sight. After an apocalyptic event, a mother wolf is separated from her mate and the rest of the pack, and has to protect her cubs from swarms of mutated humans. A detective solving the case of a disturbing film with subliminal images that is killing people who come in contact with it discovers a greater evil. The early days of brilliant, whimsical author L. Frank Baum, who gave the world The Wonderful Wizard of Oz. In a seemingly perfect marriage, a man discovers that he is actually wedded to a demon inhabiting another woman's body. At a baby shower for their longtime friend, the attendees suddenly find themselves in the middle of a different type of shower: meteors that release a vapor turning men into blood-hungry aliens. When a missing astronaut crash lands forty years after he launched having not aged a day, his elderly twin brother helps him escape the NASA scientists hunting him. As the government closes in, neither brother is who they claim to be. A corporate risk management consultant is summoned to a remote research lab to determine whether or not to terminate an at-risk artificial being. A private investigator investigates a mysterious murder at a downtown Los Angeles hotel and uncovers it's dark supernatural history. Based on true events. A deaf computer genius' world is thrown into turmoil when he meets a troubled coffee shop waitress whose voice turns out to be the only thing he can miraculously hear. When a race of genetically modified humans living secretly among us declare war on Man, the fate of the world is in the hands of a rogue "Synthetic" named Eve and a young girl who is about to discover she's not all human. In a post-apocalyptic world, a recluse, trying to recreate trees to produce new life, takes in a young girl who is on the run from some bad men, including her father.